Talk about a set of bold muggers. 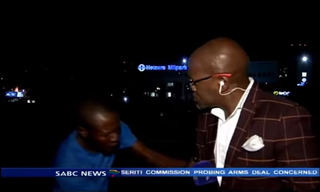 According to Mediate, South African journalist Vuyo Mvoko and his crew were held up at gunpoint in Johannesburg while waiting to file a report for SABC, the South African Broadcasting Corp., Tuesday night. Mvoko was reporting on the expected admittance of Zambian President Edgar Lungu to Milpark Hospital when two men were seen in the background of the shot approaching the journalist. “We’re being mugged,” Mvoko can be heard saying. The reporter was made to give up his cellphone at gunpoint. His crew were made to give up their cellphones, too, as well as some computer equipment. Strangely enough, and probably too bad for the muggers, they did not take the camera. Mvoko was able to upload the video in hopes that authorities would be able to find the men and take them into custody.